Experience the land of the Pharaohs, one of the world's most fascinating destinations. 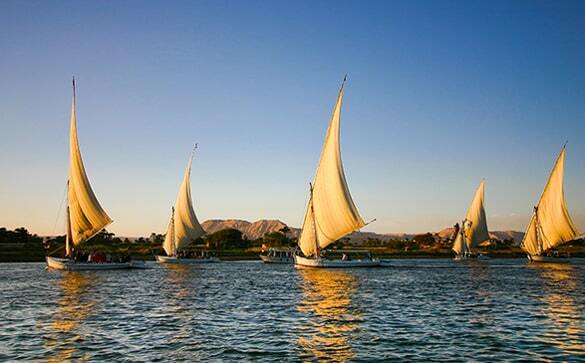 Spend three nights aboard a Nile River Cruise with all meals and onboard cruise drinks package included. We include Guided Offshore Excursions to visit Egypt's famous antiquities along the Nile such as the Valley of the Kings and the Temples of Luxor and Karnak. There are also three nights in Cairo with daily breakfast, including a visit to the Grand Pyramids of Cairo and Sphinx and The Egyptian Museum. Package includes Flights, transfers, entrance fees (except Mummy Room Cairo Museum), and all taxes there are no hidden costs. Tours involve guided small groups, and departures are 100% guaranteed. The 3-night Nile Cruise includes offshore excursions, all meals and Cruise drinks package. This Price is valid for Weekly Friday departures through 2019 and 2020. Prices are per person based on double occupancy, Single Supplement USD 399. Discover Old Cairo and visit Khan El Khalili Bazaar. Visit the City of Memphis & Step Pyramid in Sakkara. Enjoy a Sound and Light show at Karnak Temple. 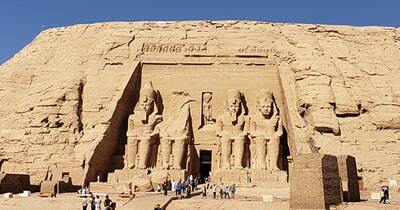 Visit the famous Temples of Philae and Abu Simbel. Upgrade your package to one of our most popular itineraries. Upon landing in Egypt, purchase your visa by filling out an application form provided at the airport and submit with the applicable fee paid in USD cash per person. Transfer to your Cairo Hotel. 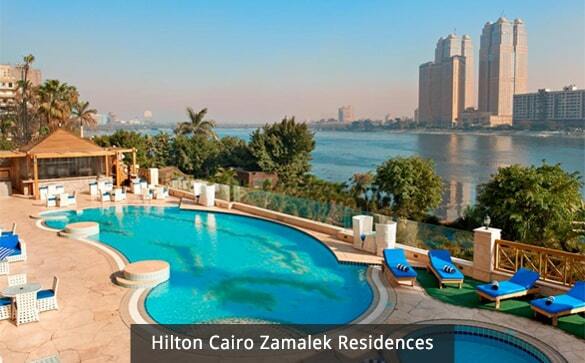 Accommodation: Hilton Cairo Zamalek Residences or Similar. This morning transfer to the airport for your flight to Aswan. Upon arrival transfer to the Port and Embark your Cruise. 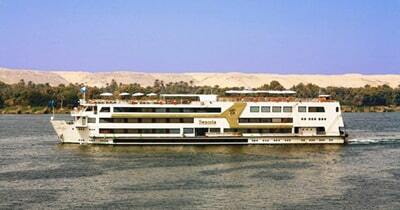 Nile River Cruise, MS Semiramis. The Ship has sixty-six cabins with private bathroom and large panoramic windows. All meals and drinks included onboard. Daily offshore excursions included. A Licensed English Speaking Egyptologist guides excursions. Later join your Guide to visit The High Dam, and the Temple of Kom Ombo. Also, enjoy a Felucca ride. Felucca Ride around Kitchener's Island & Agha Khan Mausoleum. A felucca is a traditional Egyptian sailing boat. This relaxing boat ride takes you around Elephantine Island (also known as Kitchener Island) home of the Botanical Gardens of Aswan. From the boat admire the beauty of the Aga Khan Mausoleum built for the spiritual leader of the Ismaili's, a Shiite sect. Activities included today: Flight Cairo - Aswan, Cruise Embarkation, visits High Dam, and The Temple of Kom Ombo. Also, enjoy a Felucca ride. Arrive in Edfu and after breakfast join your Guide for a visit to Edfu Temple, also known as Horus Temple. - Temple of Edfu: Built in the Greco-Roma Era this is the best preserved, and entire Egyptian temple, built to honor Horus, the falcon-headed god. The walls are lined with inscriptions and hieroglyphics depicting the age-old struggle between Horus and Seth. This impressive example of the Ptolemaic architecture is said to have taken 180 years to complete. Overnight on board while sailing to Luxor. Activities included today: Visit Edfu Temple. Sail to Luxor. - Luxor Temple: Parallel to the River Nile, Luxor Temple is a magnificent example of Egyptian temple architecture. Along with Karnak Temple, this was one of the most sacred and important Temples of Ancient Thebes (now Luxor City). This temple was dedicated to Amun Ra, King of Gods and his wife Mut (Goddess of War). Another site worth mentioning is the Mosque of Abu El Hagag which was built on top of the buried ruins of Luxor Temple; after the Temple was uncovered the Mosque was preserved and is still a place of worship until today. - Karnak Temple: Located on the East bank this is the largest temple complex in Egypt Built over a period of 1300 years to honor the god Amun of Thebes, his wife Mut, and Sons. An impressive complex of over 25 Temples full of Sanctuaries, big columns, and Obelisks. At least thirty Pharaohs have been represented here over time. One of the highlights is the Hypostyle Hall with 134 large pillars, indeed an awe-inspiring place. Activities included today: Visits to Valley of Kings, Queen Hatshepsut Temple, Karnak and Luxor Temples. Continue your tour with a visit to The Cairo Egyptian Museum of Antiquities, Dating back to 1902 this fascinating Museum contains the most extensive collection of Pharaonic antiquities recovered from the Royal Tombs and Pyramids. The highlights are the treasures of Tutankhamen and a Mummy room that displays Royal Mummies. (Mummy room at an extra fee approximately USD 20 paid locally). 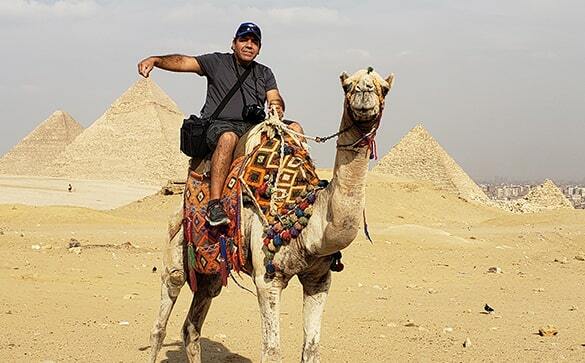 Visit The Grand Pyramids of Cairo & Sphinx, tour one of the most Famous sites in Egypt and one of the seven wonders of the ancient world; take your picture while riding a camel. Activities included today: Flight Luxor - Cairo. Visit the Egyptian Museum and The Grand Pyramids of Cairo & Sphinx. Our Representative will assist you with transfer to the airport for your departure flight. Domestic Flight Transfers Cairo - Aswan - Luxor - Cairo. Three nights of accommodations in Cairo at Hilton Cairo Zamalek Residences or Similar. 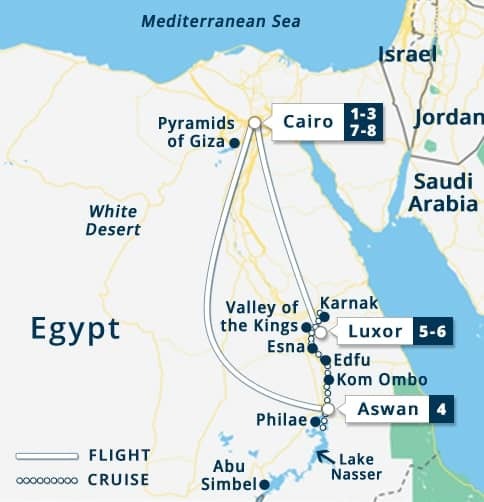 Three nights aboard the Semiramis Nile River Cruise. Visit the Cairo Egyptian Museum of Antiquities. Enjoy a Felucca Ride around Kitchener's Island. All entrance fees (except Mummy room in the Egyptian Museum). Visa fee on arrival at Cairo airport USD 25 Per Person. Fee may increase later in the year.